For many of us who completed elementary school way before the 2000s, we most likely remember learning to write through limiting, monotonous, sometimes painfully boring, assignments. Typically, the teacher chose the topic and writing style, left little room for freedom or creativity, and said “It needs to be x number of pages, and it’s due in a week.” Thankfully, traditional writing instruction has been revolutionized by the Teachers College Reading and Writing Project (TCRWP). The following entry is a snapshot of TCRWP at Hebrew Public schools. All of Hebrew Public’s network schools teach writing for grades K-6 using this innovative, engaging approach. For four years now, teachers have participated in professional development through the Teachers College Summer Institutes and we are proud to say that 44 teachers from our schools have attended, as have our directors and school leaders. What does TCRWP look like in action? What kind of writing do we produce throughout our lives? You probably answered practically and/or creatively, thinking of reports, narratives, persuasive letters, cover letters, poems, short stories, journal entries, and so on. This is the essence of TCRWP – making writing relevant to real life and the real world. The writing workshop is divided into units that mimic these real world styles of writing: opinion/argument, information, and narrative writing. Each unit can take around a month to complete but students are encouraged to work at their own pace. Throughout the process, teachers give what are called mini lessons, which provide students with specific strategies to improve their writing. For example, a mini-lesson could focus on how to choose the strongest ‘seed idea,’ create a strong ending, write with imagery, use dialogue effectively, etc. 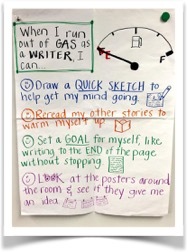 The image above shows an example of a mini-lesson: providing strategies for when students feel “out of gas as a writer,” something we can surely all relate to. What are the benefits of TCRWP?